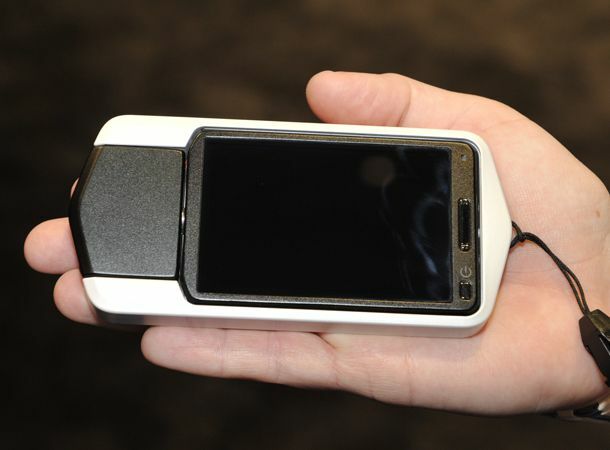 One of the highlights of CES this year was the Casio Exilim TRYX (or EX-TR100). Sitting somewhere between one of company's Casio's stylish and compact EXILIM cameras and the Flip-style pocket camcorders, it's a camera/camcorder hybrid with a few tricks up its sleeve. At first glance it looks a bit like a compact camera, but surrounding the LCD is a frame that twists around 360 degrees, so you can hold it with one or two hands. The LCD itself then twists around too, so you can shoot both horizontally and vertically. This versatile design means you can take photos using either hand and from different angles depending on what you are shooting. You can even hang the camera from a pole or hook, should you desire. At 157g the TRYX feels light and fits comfortably in your hand. We'd suggest exercising a little caution when the frame is out; although it does help you steady the device to prevent camera shake, you certainly don't want to give this to your kids to play with. The TRYX has a 12-megapixel CMOS sensor and f2.8 (2.1mm) fixed lens. So, much like the Flip Ultra HD and Panasonic TA1 there's no optical zoom. It captures 1080p movies and there's an HDMI output. Controls are minimal, with most features accessed by tapping the 3-inch 460,000 touchscreen, which you can also use to focus and take a picture by touching the screen. Pictures are stored on SD card, but Casio has yet to announce battery information. Where the TRYX differs from camcorders like the Flip, is a feature set that is much closer to Casio's EXILIM camera heritage. Casio's equipped the TRYX with HDR technology, which takes shots at different exposures, combining them to create a final image with less washed out highlights, while retaining detail in dark areas. This is expecially useful in high-contrast situations. One feature Casio was keen to promote is HDR Art function, which lets you use three processing levels: strong, standard and light to turn your photographs into works of art We saw a few examples and results varied from very effective, to a neon mess, and although it's a nice feature to have, it's not necessarily one we'd use very often. We really like the Casio TRYX, it turns the traditional compact camera design upside down, offering composition flexibility to the photographer. We do have reservations about the durability of the flip out frame and ultimately whether the Tryx has mass-market appeal, but we'll reserve judgement until we get a review sample. Ultimately it's fantastic to see something new. Available in black or white, the Casio TRYX is out end of March/early April in the US for $250. There's no news on UK pricing yet.